Ocean Park Hong Kong is a marine-life theme park opened in 1977for featuring exhibits of animal, various rides, shows and thrill. In 2012, it became the first Asian winner of the biannual Applause Award, the most prestigious award in the amusement and theme park industry. This has given for its impressive ability to offer guests a world-class experience that blends entertainment with education and conservation was confirmed. 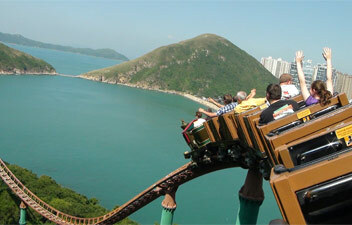 The park covers more than 915,000 square metres and is located on the southern side of Hong Kong Island. The Waterfront and The Summit areas are connected by Ocean Express funicular trainand the Cable Car. During festive seasons, Ocean Park Hong Kong will organise special events such as Asia’s biggest Halloween party, Summer Splash water play and Halloween Bash activities. 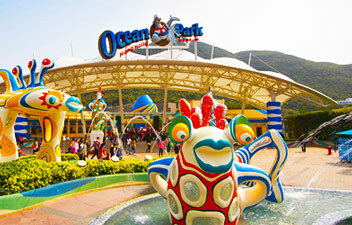 Ocean Park Hong Kong is committed to supportingand promoting animal conservation in Hong Kong and throughout Asia. Part of the proceeds from admission tickets and some retail items will go towards the Ocean Park Conservation Foundation Hong Kong to support wildlife conservation projects. Adventures in Australia brings you on an opportunity to meet captivating and vibrant Australian animals in Hong Kong! Discover the rich history of Australia while discovering how you too can adopt a Lifestyle of Health and Sustainability. Here you can watch the red-necked wallabies springing aboutand furry koalas perching on branches and, and don’t miss the sweet serenade of the laughing kookaburras! Here you have the spectacular opportunity to a journey deep underwater to meet over dozens of sharks and rays that shatters the myths surrounding them, including the sawfish with a saw-like rostrum, and the zebra shark with leopard-like spots! Discover their beauty from 360 degrees at this exciting exhibit. Old Hong Kong - Relive fond memories of times gone by! Savour the sights and sounds of yesteryear aboard the Heritage TramOld Hong Kong brings. Here you can explore the unique culture of Hong Kong in the 1950s, 1960s and 1970s back to life! Be mesmerised by the colour and buzz of life in accurate recreations of old streets and scenes. Take a trip into nostalgia and take home some antique souvenirs to keep the memories alive! Soar with The Aviator to feel the sensation of flight, before knocking around on bumper cars.In this zone, guests can dangle off a cliff on the floorless roller coaster, Hair Raiser, or hang upside down while swinging on The Flash. Enjoy this high speed and energetic classicride on Rev Rooster. On this journey, you will encounter some of the most fascinating animals in the world! Hop aboard a raft and become immersed in the exotic sounds of a tropical rainforest. Catch the antics of the world’s smallest monkey, the Pygmy Marmoset; or see weirdly wonderful critters, including the Capybara, the world’s largest rodent, and Kinkajou, as well as the Green Aracari, the world’s smallest toucan. Aqua city is a world-class marine-themed domain where you can watch Symbio, a multi-sensory show featuring the world’s first 360-degree water screen. You can embark on a journey of exploration into the Grand Aquarium,or through a giant viewing panel eight by 13 metres largeor view marine life from the world’s largest aquarium dome. It will be nice dining experience at Neptune’s Restaurant which is Kong’s first aquarium dining restaurant! Admire the spectacular display of goldfish at the Goldfish Treasures exhibit, or visit the colourful birds and playful Asian small-clawed otters at Panda Village.At the Amazing Asian Animals exhibit you can visit some of Asia's rarest animals. Take an interactive journey of discovery at the Giant Panda Adventure where you’ll get to know some of Asia's most precious native animals, including giant pandas, red pandas, Chinese giant salamanders and Chinese alligators.